Through this State Homeland Security Strategy (SHSS), the State of Alaska will improve its protection of the people, its economy, and its culture. 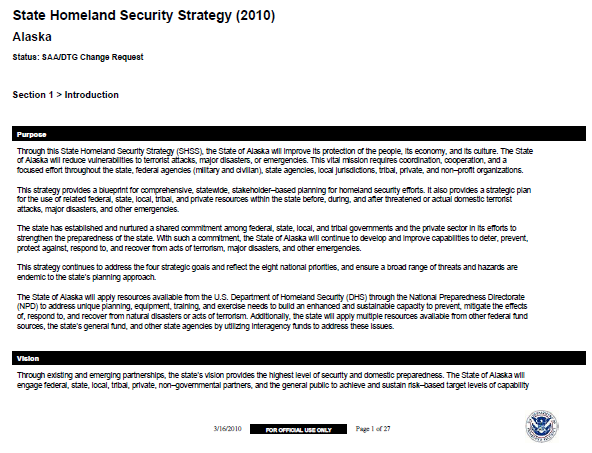 The State of Alaska will reduce vulnerabilities to terrorist attacks, major disasters, or emergencies. This vital mission requires coordination, cooperation, and a focused effort throughout the state, federal agencies (military and civilian), state agencies, local jurisdictions, tribal, private, and non–profit organizations. This strategy provides a blueprint for comprehensive, statewide, stakeholder–based planning for homeland security efforts. It also provides a strategic plan for the use of related federal, state, local, tribal, and private resources within the state before, during, and after threatened or actual domestic terrorist attacks, major disasters, and other emergencies. The state has established and nurtured a shared commitment among federal, state, local, and tribal governments and the private sector in its efforts to strengthen the preparedness of the state. With such a commitment, the State of Alaska will continue to develop and improve capabilities to deter, prevent, protect against, respond to, and recover from acts of terrorism, major disasters, and other emergencies. This strategy continues to address the four strategic goals and reflect the eight national priorities, and ensure a broad range of threats and hazards are endemic to the state’s planning approach. The State of Alaska will apply resources available from the U.S. Department of Homeland Security (DHS) through the National Preparedness Directorate (NPD) to address unique planning, equipment, training, and exercise needs to build an enhanced and sustainable capacity to prevent, mitigate the effects of, respond to, and recover from natural disasters or acts of terrorism. Additionally, the state will apply multiple resources available from other federal fund sources, the state’s general fund, and other state agencies by utilizing interagency funds to address these issues.